The National Reconciliation Commission (NRC) has begun investigations into the execution of eight Army Generals after the 1979 coup. 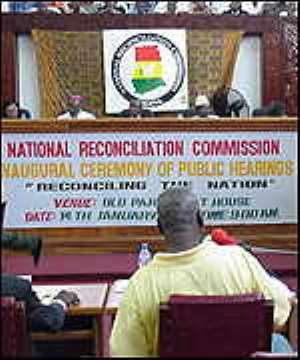 A member of the commission, General E. A. Erskine, made this known when Nana Amankwa Afrifa II, a brother of one of the executed Generals, made an appeal at yesterday's sitting of the NRC in Kumasi.Nana Afrifa, who is the chief of Mampong Krobo, and a brother of the late General A. A. Afrifa, had petitioned the commission to try and find out what exactly was the crime of General Afrifa to warrant his execution by the Armed Forces Revolutionary Council (AFRC). “I do not understand why the Rawlings government decided to kill my brother when apart from the Acheampong regime that briefly arrested him, both the Busia and Akuffo governments did nothing to him,” he told the commission. He said it was also questionable that apart from General Afrifa, none of the members of the defunct National Liberation Council (NLC) government was arrested by the AFRC. Giving the background to the arrest of his brother, Nana Amankwa Afrifa, said soldiers numbering about 40 went to the late General Afrifa's farms called Okatakyie Farms, near Krobo in three military vehicles and arrested him, sent him to Kumasi before transferring him to Accra and then to the Nsawam Prisons. He said all attempts by the family to locate and talk to General Afrifa while in detention failed, adding that he and other family members were still in Accra trying to locate him when they heard on radio on June 26, 1979, that General Afrifa had been executed by firing squad. Witness expressed concern that in spite of the efforts being made by the NRC to reconcile the nation, former President Rawlings seemed not to have regretted the killing of the Generals. He produced a copy of the November 19, 2003, edition of the Daily Dispatch newspaper, which quoted former President Rawlings as saying, “Yes I Killed Afrifa”, and questioned whether the architect of the execution had indeed shown remorse for his action.Nana Amankwa Afrifa stated with regret that at times some of the statements of Mr Rawlings were very provocative and said with this year's elections approaching, it would be good for the NRC to find a way of advising him to watch his statements. To a question by General Erskine, witness said he was the one who took delivery of the remains of General Afrifa after the body was exhumed.Witness called for compensation for the family. Madam Monica Akosua Nkuri, the mother of the late L/Cpl Halidu Gyiwa, who also appeared as a witness, appealed to the commission to help exhume the remains of her son in order for the family to give him a proper burial saying up till now, she had not been told where her son was buried. She said after the December, 1981 coup, she heard that Gyiwa was arrested but later released only to be rearrested and killed in 1983. According to Madam Nkuri, she did not hear that Gyiwa was tried in any court and did not know why he was killed. She stated that after the execution of her son, a soldier she knew went to tell her that Mr Rawlings had sent him to inform her that he (Rawlings) had a battle with Gyiwa and had killed him. Witness said as a result of the arrest of Gyiwa his other three children fled into exile for fear of their lives and have since not returned. Madam Nkuri continued that after the 1981 coup, Gyiwa came back home with a wound on the hand to seek medication and when she questioned him why he took part in the coup, he said it was Mr Rawlings who convinced him to overthrow the government.She indicated that soldiers harassed her during the arrest of Gyiwa in 1983 and apologised to the nation for the involvement of her son in the December, 1981 coup.